As the image below illustrates, I have two forms and two buttons. Currently all the forms are visible. How can I only show the requested form "according to the option they have selected (from the blue buttons on the top)"? So, if the user clicked on the "send an invite" button, the sent an invite form will appear and the blue buttons will disappear "you can go back by clicking the back button". Is it possible to use dynamic ID dedication using JS to achieve this? 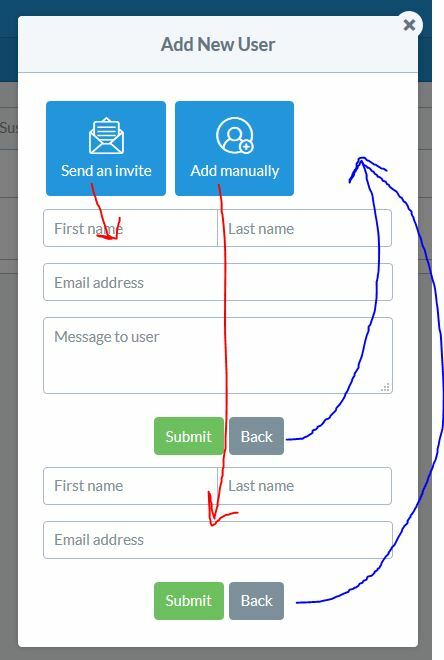 as I will have more than 2 options on some pages etc... For example, give the <a class="button button-box"><p>Send an invite</p></a> an id "#send-and-invite-form", it will then find the form that has that ID and show it. Then hide the div that contains those boxes until clicked back. EDIT: This could be a solution to make it completely independent of ID/Classes. This will work for corresponding <a> and <form> only,so make sure that you have them in order.